I've told you before what a great community of tatters there are online. Recently, Diane, the Lace Lovin' Librarian, got a little carried away with bidding on and purchasing handkerchiefs on eBay. Her solution was to share the hankies with her fellow tatters. The hanky I chose is white with beautiful flowers stitched in variegated pink thread. 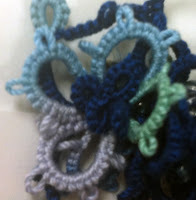 Since I haven't tackled tatting edging for a hanky, this is a new challenge for me. Keep watching to see how I do. If any of you tatters out there have edging pattern suggestions, feel free to share them. 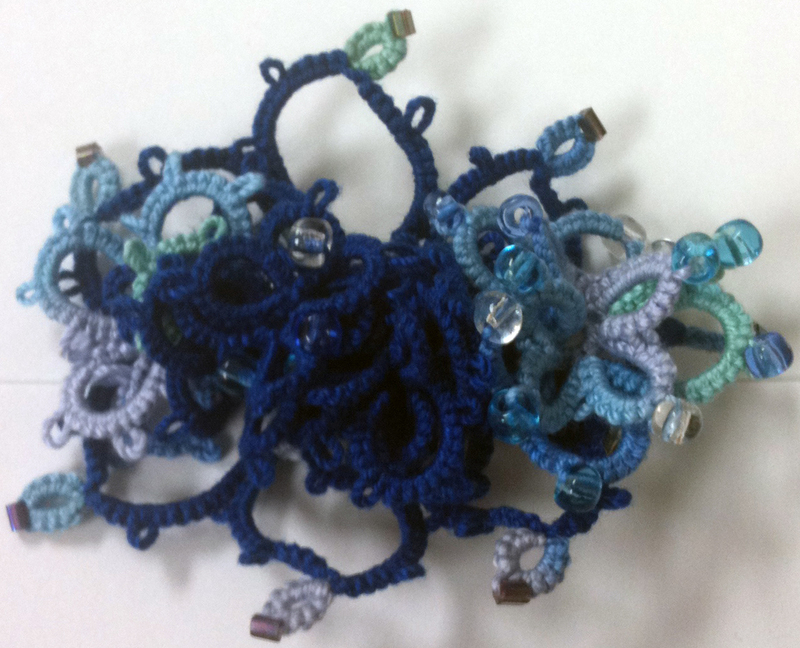 The Australian Tatters' Guild has a page with various tutorials listed. Another tatting tutorial for beginners can be found on Tat-a-Renda. How2Tat has several great videos on YouTube for learning to tat. Many people do better seeing the techniques in a video format. Georgia Seitz does online tatting classes. She is one of the better known tatters online. 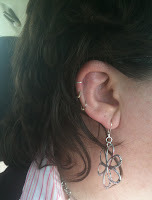 If any of you end up giving tatting a try, I'd love to hear from you. When I went to list the newest bracelet in my shop last week, I was more than a little surprised to see that Etsy had changed the listing process. Although some Etsy changes can take some time to get used to, these changes are long overdue. They started rolling this out in early May, testing it on a few lucky shops. I believe it has now been changed for everyone on Etsy. Along the way, the feedback they received led to some great improvements. The entire listing process takes place on one page! I know I wasn't the only person going back and forth between pages while trying to list an item. What color did I say this was? Did I remember to add the measurements to the description? Etsy is also asking some new questions as part of the listing. They say this is part of helping the search process. Want to see more? Click on the image to enlarge it. You will be able to pick a top category (like Jewelry), then a subcategory (bracelet), and then another subcategory (if possible). It will leave you with 13 total tags to use further down the page. Because of this arrangement, I found that I was able to add at least one more tag to my listings. I also discovered that I could select all five photos at once to have them upload at the same time...Yippee! Once you're done filling in everything for your new listing, you will get to preview it and you'll be given the option to publish the listing or save it as a draft. I have seen people make comments about being able to save their listings as drafts before, but I never could figure out how to do it. Now it's an official part of the process and I couldn't be happier. If you only have one day a week to put all the listing information in, but you don't want all your items to go live at the same time, this is a lifesaver. Get all your listings done, save them as drafts, and then activate them the way you want to - one a day, several per day, etc. 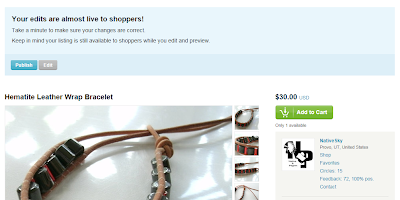 As soon as you publish the listing, Etsy will offer you the chance to promote it on Twitter and Facebook. While I wouldn't use these for every single item (especially if you're doing a bunch at a time), it's good to share your new listings from time to time so people remember your shop and the kinds of things you sell. 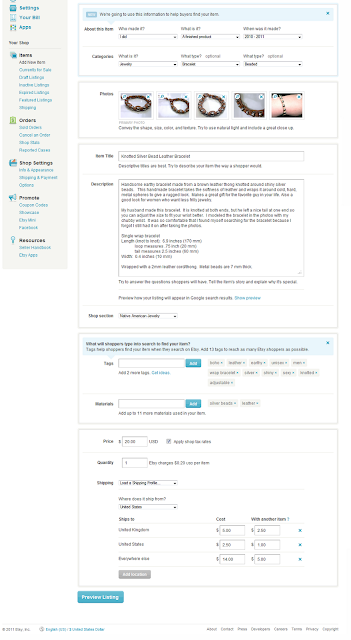 This new process will also pop up when you go to edit your existing listings. You'll answer the new questions at this time. What I love about the change here is that your item stays active in your shop while you edit the details. I always hated that my newest piece was off the market while I fixed some spelling error...urgh! If you don't want someone to be able to see or purchase it while you are editing, you can deactivate it first. If you raised the price during the edit and someone actually did purchase it during that time, the customer would be told of the change during the checkout process. The original announcement for the change mentioned requiring new photos used in listings to be 570 pixels or larger. This requirement has now been removed. It never affected previous listings. What if I don't know when the item was made? You can either go with your best guess for a newer item or choose "some time before 1992 "" if it is a vintage item. Why are you asking when the item was made? Etsy's answers have implied that this is mostly to help customers who are searching for vintage items from a particular time period. Your answer on this will not be visible to customers on your item's listing. Is it true that item listing titles now have a character limit? Yes, listings now have a 140 character limit in the titles. This is a big time saver for me when listing my items and it makes more sense. Etsy is always looking for ways to improve and they struck gold with this one. The next change I'm waiting for is the ability to change your user name (they say that some options are in the works). Last week's Etsy Wednesday pick is Sarahndipities. The owner of this shop is Sarah (hence the name) and she is a life-long crafter. I love how she phrases this - "My mother was nearly driven insane by my desire to keep leftover tidbits and scraps of material, yarn, paper, wire, clay, beads, rocks, twigs, foil, and various other objects." 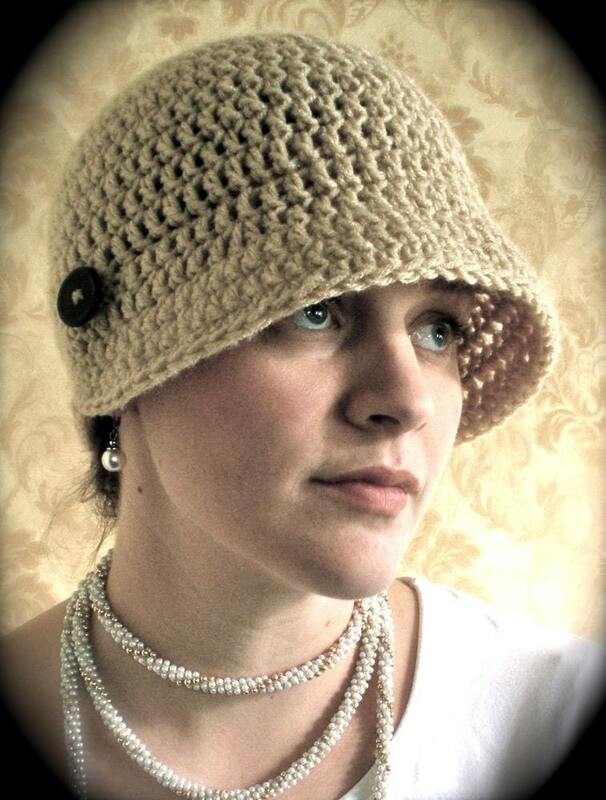 It can be hard to stand out in the world of crocheted hats, but Sarah impressed me with this adorable flapper style hat. Yes, I've finally lost my mind. I took an age old art form and decided to upcycle it. I hope my fellow tatters can forgive me this attempt. I'm not sure what came over me. After seeing some blog posts by people who have created their own tatting shuttles, I really really wanted to try making one of my own. Being the kind of crafter who doesn't mind playing with trash, I decided to make the shuttle from materials I had around the house. I used a regular sewing machine bobbin for the inside of the shuttle. For the outer parts, I cut pieces out of a convenience store soda cup. You'll probably notice that it's from the same convenience store as some of my previous upcycling projects (Maverik). To enhance the curve of the plastic, I heated it up over the burner of my electric stove. This also helped round out the edges so they wouldn't catch on the thread. Gluing everything together wasn't as smooth as I hoped. I tried a couple different types of glue and I'm still not confident that it won't fall apart on me at some time. Once the glue was dry, it was time to test this experimental shuttle. I was able to tat with it just fine. The plastic is still flimsier than the usual shuttle, making it awkward to hold at times. 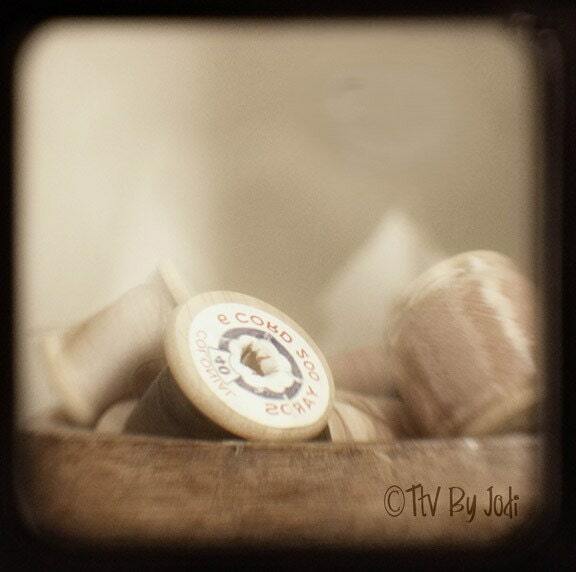 It really wasn't much better than just using the bobbin by itself. I come up with plenty of ideas on what I'd like to have as a very special tatting shuttle, but it looks like it will take a lot more work (and practice). Monday Madness - What are Etsy Circles? When Etsy was making changes to their site last year, they added a new feature called "Circles." I'll admit I ignored it completely at first since I didn't really understand it and it seemed like another type of social networking. I'm just about social networked out already! The whole circle thing keeps popping back up as people add me to their Etsy circles, so I decided I had better learn more about it. 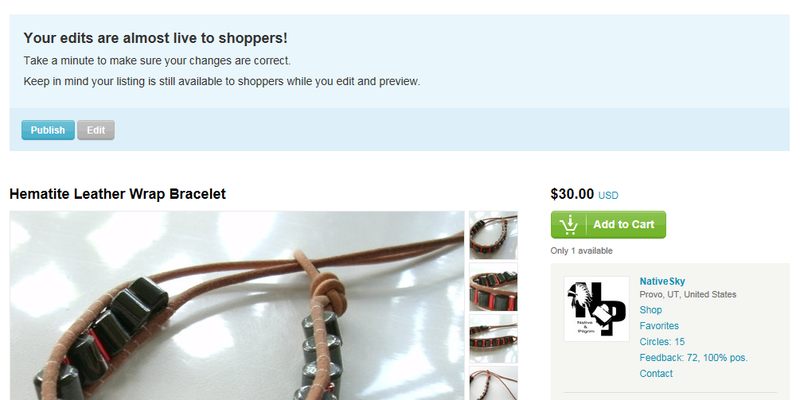 Etsy already has a good tutorial for using your Circle, so I won't duplicate their efforts. 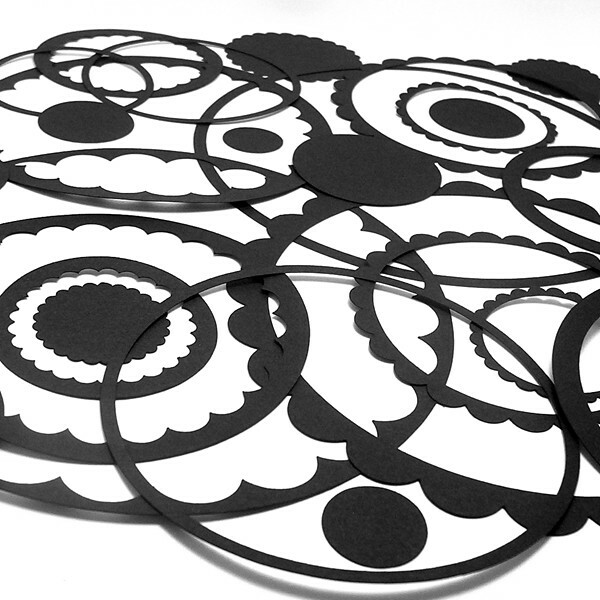 They also have this article about the value of using circles and activity feeds on Etsy. It's not the same as a social network like Facebook or Twitter. Including someone in your circle means you can watch their activity feed - see if they added items to their shop, marked other shops or items as favorites, created treasuries, etc. It's a little bit stalkerish, but the Etsy tutorial on circles also tells you how to block someone (in case it really is a stalker). Crafting an MBA wrote a great article about using Etsy's circles and activity feeds to research your ideal customer. You can learn a lot about your customers' preferences and buying patterns by studying their Etsy activity. 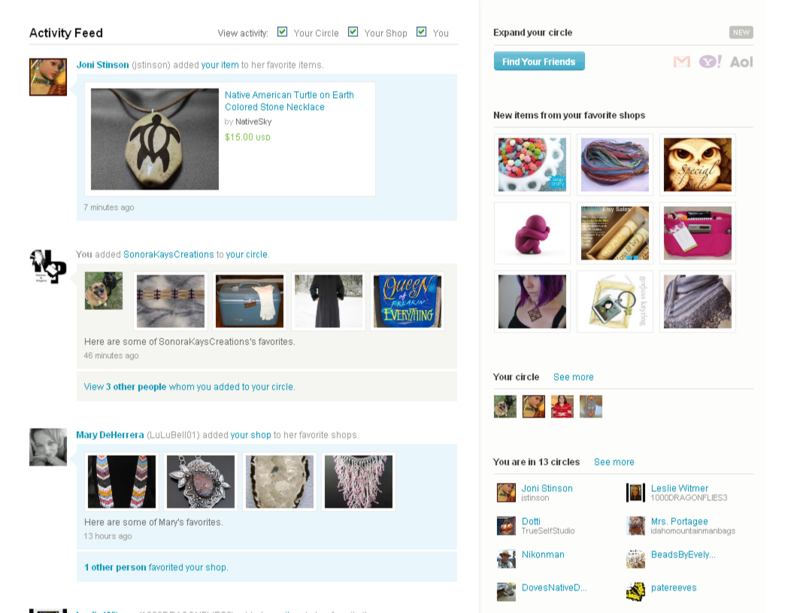 The other nice thing about these activity feeds is that with every connection you make, whether by adding someone to your circle or making them a favorite shop, more of their activity shows up in front of you on Etsy. You'll see more of the items they add to their shops as well as the items they mark as favorites. I often see items there that I want to look at more closely. It gets you clicking over to their shop. 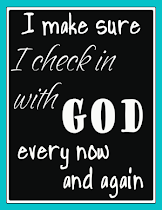 Other Etsians who have added you to their circle will have that same experience, seeing your activity. If they "favorite" something in your shop, that will be seen by others who have included that person in their circles. It's like having the friend of a friend of a friend recommend something. Your shop and items will be seen by many more people than by searches alone. I'm relieved that the Circle concept isn't really some new social network. Used wisely, it makes a helpful research tool and can make you aware of activity on Etsy. Even if you don't create a circle of your own, the people who add you to their circle are helping you market without even knowing it. One of the problems with trying to fill your Etsy shop is coming up with materials to make your products. It's a problem because it can be very expensive to stock up on the necessary items when you don't have many or any sales coming in. I know we've accumulated a bit of a stockpile from taking advantage of good opportunities. Now we just have to get the sales coming in. If you've been reading my blog for some time then you'll remember my last obsession with upcycling. I still wear my plastic cup bead necklace and upcycled flower hair clip. With some imagination and encouragement from my hubby, I'm diving into a new obsession. I won't give it away right away so you have time to guess a little at what I'm doing (see pictures). Don't have the money to shop for supplies? Time to get resourceful! One of the most inspiring upcycling blogs I've found is this one by Mich L. in L.A. She does some incredibly creative stuff with the wackiest of items and has contests for people to guess what she used. Dollar Store Crafts is another great blog that gets creative with inexpensive (cheap) supplies. Once you get an idea of the kinds of things you can use to make jewelry, you'll realize that your house is full of possibilities. 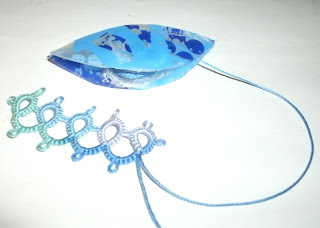 The Beading Gem's Journal publishes some great recycled jewelry projects from time to time. Other blogs have shown how to turn old shirts into purses and even flowers for headbands and other accessories. 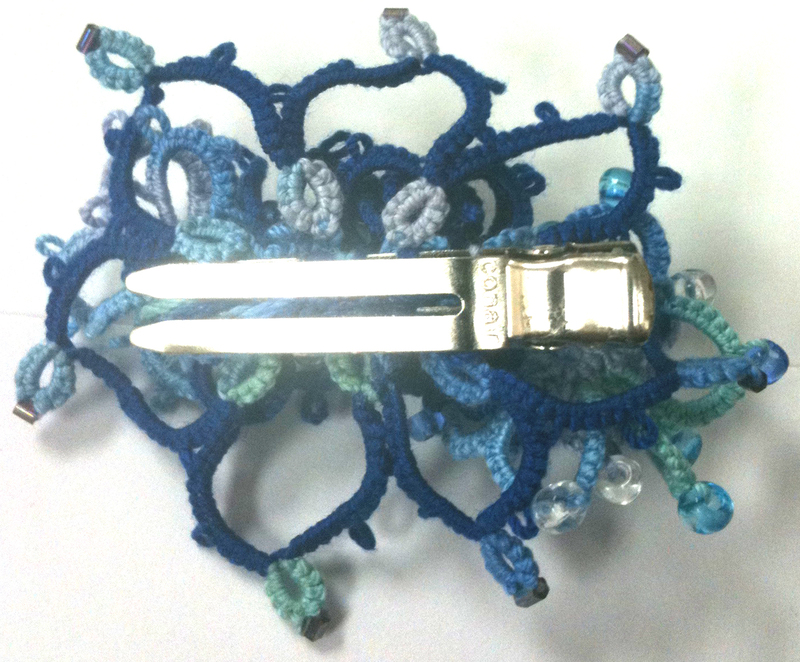 Want to see what you can do with some twist ties? The California Art Education Association had a fun workshop on this. Another blog did a delicate bird's nest jewelry piece from twist ties. Take a look around - you may have enough things on hand to get some projects going. What did I use to make these cute flower earrings????? Diet Coke cans! Yes, my Diet Coke obsession knows no end. We are working on some new items to add to our shop and I loved taking these cute dangle earrings for a test drive. Do you have any fun upcycle or supply ideas? I'm linking up this project at Just Something I Whipped Up, Making the World Cuter, Today's Creative Blog, Tip Junkie, and CraftOManiac. Last week's Etsy Wednesday pick is Words For You. This shop was started by two architects who wanted to bring a personal touch back to graphic design. 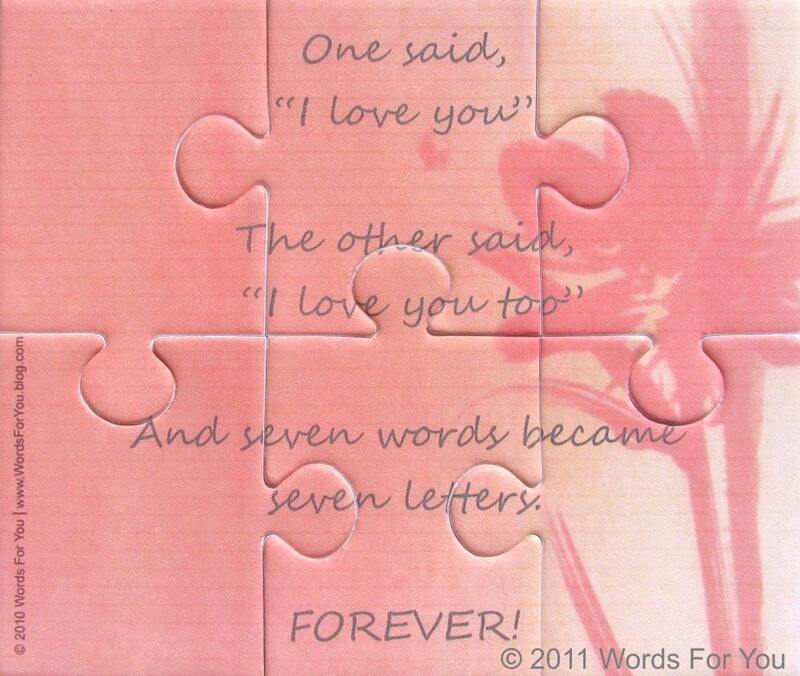 Fun messages and designs are made into puzzles and sent in a pillow box for the receiver to assemble and enjoy. You can even have your own pictures and messages incorporated into the design. I like the interactive nature of these puzzles. One of the really great things about having a skill like tatting is that you can impress people with the gifts you make for them. Tatters are often guilty of giving away most of their work. People will watch you as you're tatting away on your latest project, start asking questions, and the next thing you know, you're offering to make them something. Most of the time, I make smaller items as gifts for those people and bigger items for close friends and family. Recently, a student I worked with in one of our plays was more curious than most. She had a real appreciation for the handmade, so I promised to make something for her. Because we try to avoid favoritism in the treatment center environment, I knew I would have to wait for her graduation to be able to give her a gift. Yesterday, at the culmination of our latest play, this student graduated and I was able to present her with this one-of-a-kind creation. She loves fancy hair decorations. Rather than use a pattern, I made it up as I went along. 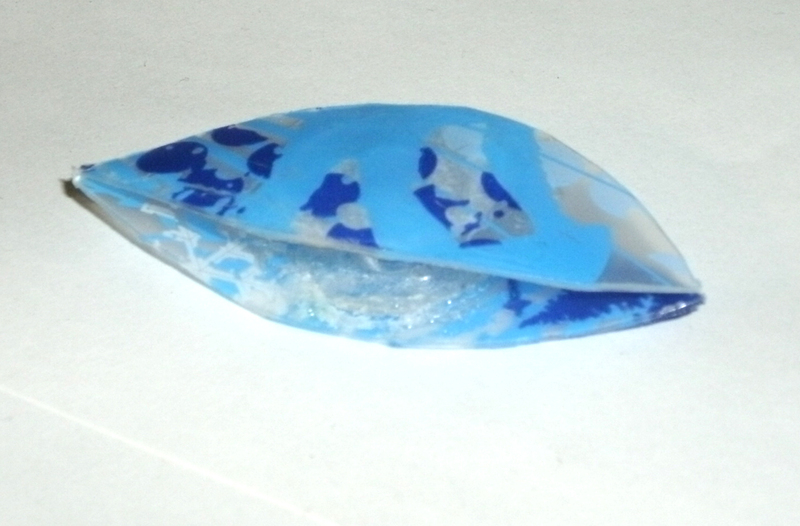 The base is an oval design with small bugle beads at the ends of the outside rings. That base is topped by four flowers. The middle two are in a solid blue, size 10 thread. 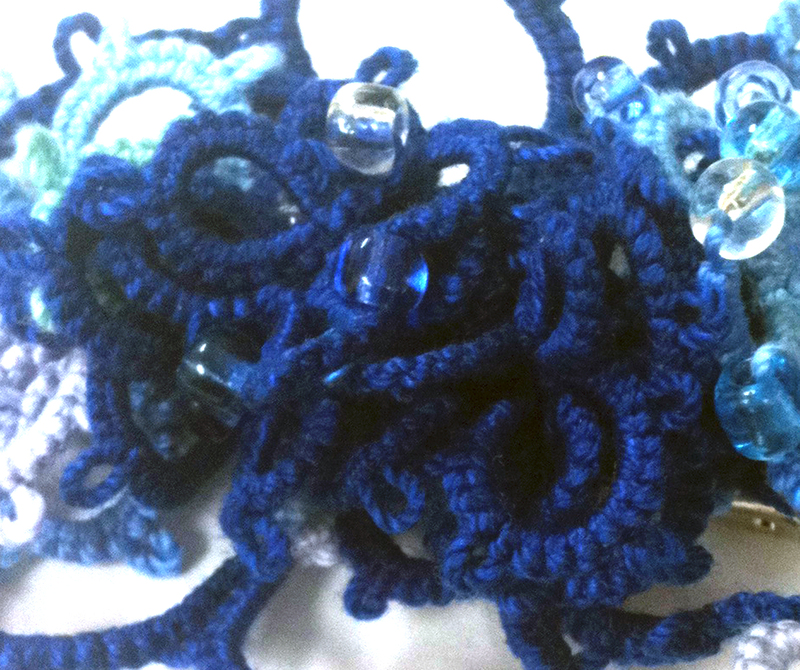 Made mostly with rings, one of the flowers is accented with glass beads. 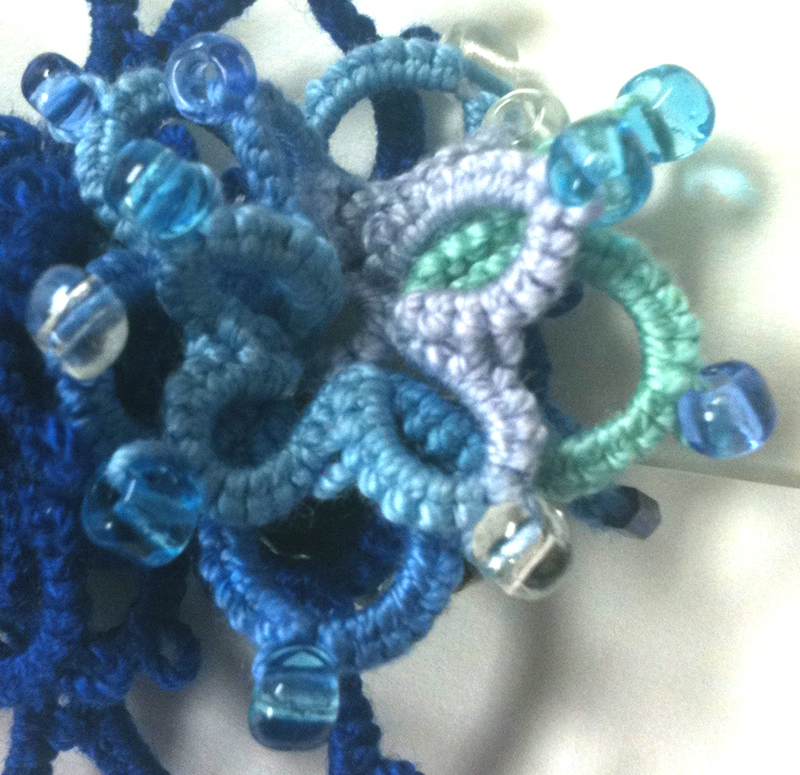 A flower at one end is in size 10 variegated blue thread with some solid blue rings to accent the middle. 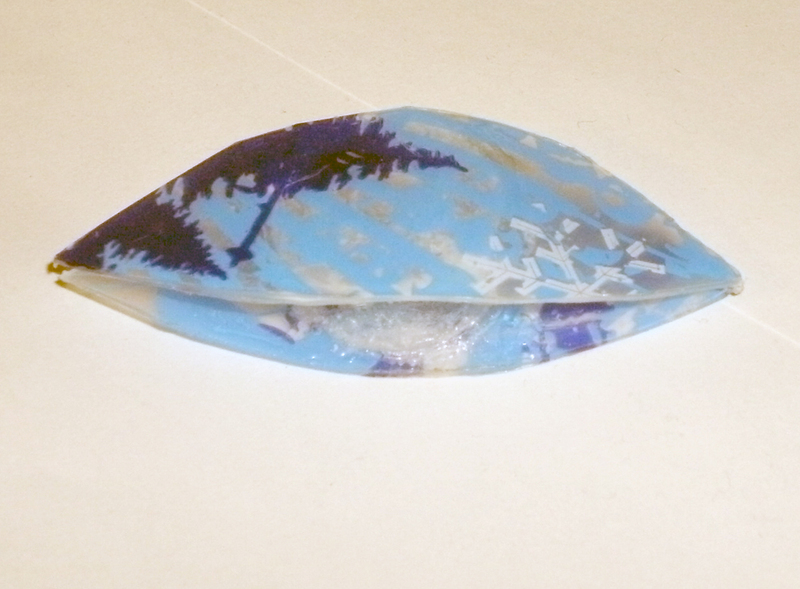 At the other end is a variegated blue flower with glass beads. I'm happy with how it turned out and she was excited to receive it. Unfortunately, I can't show you how beautiful she is wearing it (privacy, you know), but I will tell you she was gorgeous. This was a very fun project, but maybe I should have jotted down what I did so I could replicate it some time. 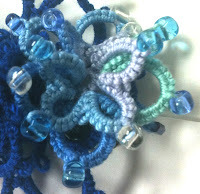 This project is linked up over at Craft-O-Maniac. I'm sure I don't have to tell you how difficult it is to be a small business in a crazy economy and a retail industry dominated by mega retailers like Walmart. May 16-20 has been declared National Small Business Week by the President of the United States. There are so many wonderful resources out there to help our small businesses. I've also learned that networking with other small business owners can help you avoid the pitfalls others have fallen into. It's also helpful to connect with someone with more experience who is willing to mentor you during this adventure. One thing that can be difficult for those of us selling online is that we're often our only employee and we just can't do it all. How can you possibly generate creative ideas, make amazing products, create and manage a beautifully designed sales website or Etsy shop (not to mention a blog on top of it all), market/advertise/promote your business, and keep in contact with customers, etc.? I have discovered some creative ways people have managed this chaos. Look for outside sources of help with designing your website or Etsy shop. I have designed Etsy shop graphics for other shops in exchange for some free items from their shop. You may have friends that have the necessary design talent or you may need to consider paying a designer. It's definitely worth the expense to have memorable and professionally done graphics. Unless you have some design skills, this is not a do-it-yourself project. Hire someone to manage your Etsy shop listings if they are bogging you down. A friend of mine enjoys doing live sales events, but doesn't like managing her Etsy shop. She hired someone to manage her Etsy shop for her. That person lists new products, renews them, and lets the shop owner know about orders to ship. This is a service I will be offering soon (as soon as I get the terms of the agreement figured out). Let your family help you. I have been blessed to have a husband who comes up with amazing creative ideas to help our business. He sketches them out and I try to make them come to life. Spouses and children can help with some of the things that don't require a certain expertise. Have them cut things out, sort or assemble certain parts, assist with packaging, etc. Imagine the time you would save if those little bits of help! When I was in high school, I used to start sewing projects fully intending to wear the item the next day. After staying up so late that I couldn't stop making mistakes, I would take a quick nap and wake up to find that my mom had finished the hem. Her help made a huge difference. Find online resources for making you look more professional. For my day job, I get to use a service called Constant Contact. 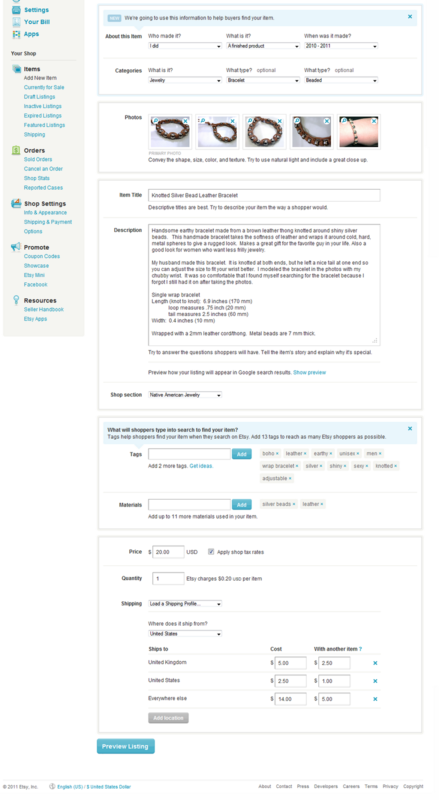 It allows you to easily create very professional looking newsletters, invitations, and more to email to your customers. You can try it free for 30 days and see how you like it. Constant Contact also tracks who opens the email and which links they click on. If you plan on regularly emailing customers about new items in your shop, a service like this is definitely the way to go. These are just a few ideas, of course. I often think that I can do it all myself, only to find myself sobbing and curled up in a corner because I end up running out of time and sanity. Just because you can do it doesn't mean you should. Getting help where you need it will keep your business venture much more enjoyable and your brain relatively sane. I have very mixed feelings about Mother's Day. My original joy in this day was celebrating my own mother. Ever since my mom passed away nearly twelve years ago, I struggle to celebrate. Even though I am a mother myself, I never felt I truly lived up to the title. The Chaplain at Heritage, where I work, once noticed on her calendar a reference to Mothering Day. She liked the title because it honored all those who "mother" rather than just those who give birth. Many who have cared for and taught my children over the years embodied this mothering spirit despite having no children of their own. At Heritage, we act as "appropriate parents" to the students while they are receiving treatment. Even when I'm tutoring students, I feel like a mother to them. Because of this, I choose to look upon this day as Mothering Day. Endure to the End - No matter what life throws at you, don't give up. Mom lived for many years with multiple sclerosis before succumbing to its crippling power. She managed to stay positive and continue to help people even when unable to walk. Keep Learning - Even though Mom never finished her college degree, she took every opportunity to learn new things. She learned her coworkers' duties along with her own and made herself incredibly valuable. That is one of her lessons I have already experienced the benefits of. Don't Mind the People, Just Remember What is True - Whenever i was upset with a situation, Mom would remind me that people aren't perfect and you have to stay focused on what it true. It's easy to get caught up in hypocrisy, office politics, and family squabbles. Staying focused on what is true and what is important will help you let go of petty differences and have a forgiving heart. Amore Valkyrie is an example of what I like about Etsy. Shops like this are so fun to look through and could easily get lost in a real world setting. It reminds me of those fantastic little shops that nobody knows about and are tucked away in the inner city. Run with passion for the unique and eclectic, it would be hard to stay in business without the kind of exposure you can get by selling online in a popular marketplace like Etsy. The designer behind all these creations explains "Amore Valkyrie grew out of my hunger to experiment with beautiful things, and to infuse jewelry with a subtle "Old World" look - now I'm passionate about finding the most beautiful semiprecious gemstones, and integrating these jewels with gold vermeil, sterling silver and other precious metals." The shop has been open just one year, but has 168 sales. There have been some times of drought (I am way too familiar with those! ), but it looks like things are picking up and going strong. 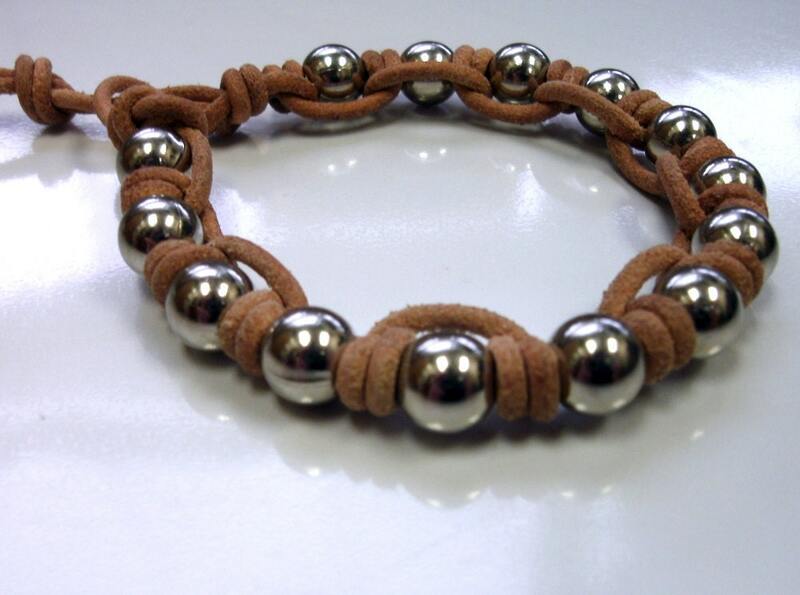 Don't you just love this bracelet? I have always loved the "slave" type bracelets and the combination of rings and bracelets enveloping the hand. 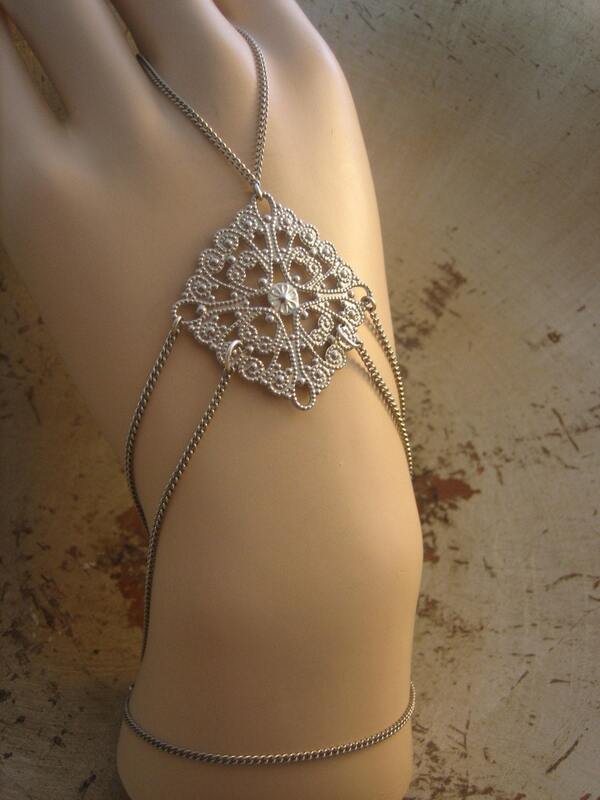 As Amore Valkyrie describes it, "Hand bracelet, panja, chain web bracelet, ring bracelet hybrid, slave bracelet, slave chain, ring hand bracelet, ring to hand bracelet, slave chain bracelet, hand chain ring -- call it whatever you like, there is no one name for it." She took a popular concept and made it her own. 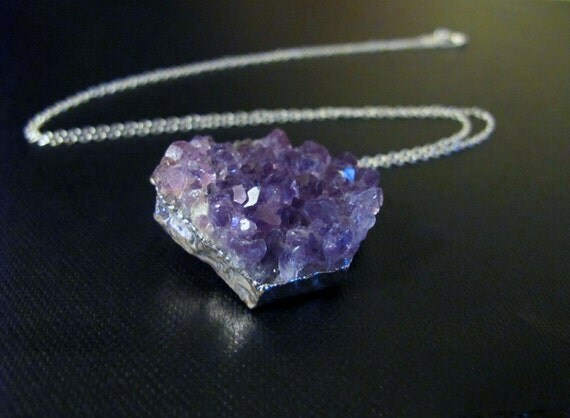 Another great piece at Amore Valkyrie is this chunky Amethyst necklace. As a larger, more voluptuous woman, I like bigger necklaces and try to avoid the dainty ones. Nothing dainty here! It also brings back memories of my grandpa. He was quite a rock hound and had a beautiful collection of gems, including amethyst. 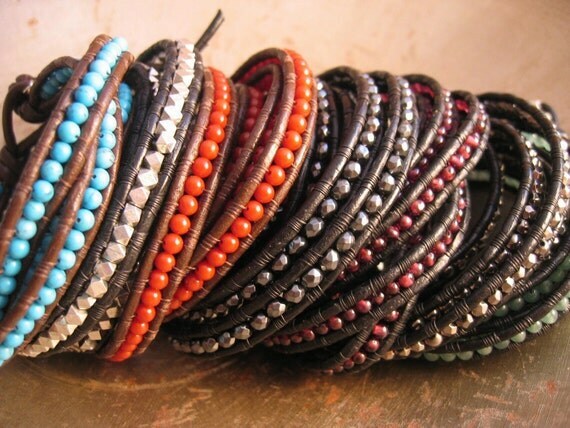 I haven't tried these kinds of bracelets, but the shop owner says she is currently expanding the variety of the beaded leather wrap bracelets she is offering. There is definitely a style to match every taste. Take a look around Amore Valkyrie and see for yourself. The photos are beautiful and enhance the jewelry. I applaud her for creating a shop that reflects her own tastes and puts a new and unique twist on things. It's a great reminder to be yourself and do what you love. My husband and I are proud owners of the cutest beagle puppies. Gambit is male and just over a year old. He's mine. Storm is female and only about six months old. She is my husband's dog and she absolutely adores him. I'm not exactly sure why, but our puppies seem to think they are cows now. Storm was the first to start regularly munching on grass in the backyard. Nothing will distract her from chewing on those green blades. My husband believes this behavior is due to an upset stomach or a need for some nutrient. I have no idea and it's just weird. It didn't take long before Gambit decided to join in on the cow action. He's not quite as focused on it, but he seems to be giving it a pretty good try. Last week's Etsy Wednesday pick is Eternal Autumn. One of the really cool things about Etsy is that there's something there for pretty much anyone's tastes. 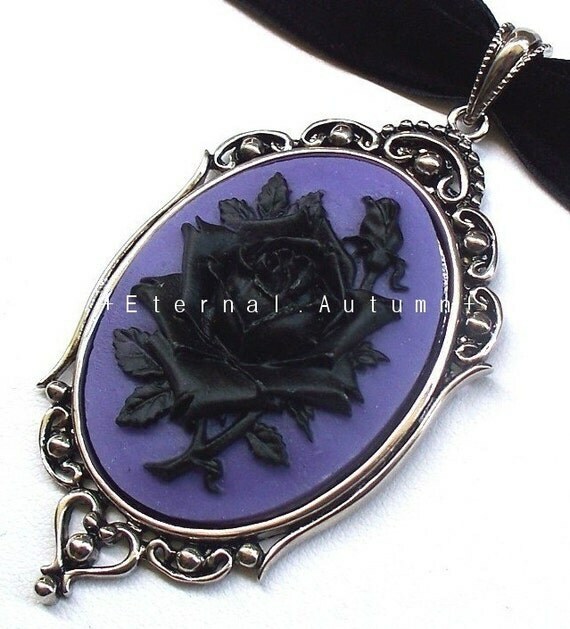 Eternal Autumn is one of those shops that has a dark twist with Gothic jewelry and lovelies for those who like a macabre touch. I fell for this beautiful black rose choker and found this shop to be a good example of sticking with your niche. Crafting seems to have gotten a reputation of being only for women - not true! I keep trying to figure out how this happened. Is it because men have traditionally worked outside the home while the women managed family life and had time on their hands for making things? Are men just shy about promoting themselves? This subject has come up several times in our household. Cricut Man enjoys being creative, but doesn't want to be linked to things that are usually linked to women. For example, we attended a scrapbooking expo and it was dominated by women. Neither one of us is into scrapbooking, but we use a lot of supplies that scrappers use. Still, it was uncomfortable for guys to be in that crowd. Using a machine like the Cricut Expression isn't limited to women. Men like to use it, but first they have to get access to it. I love this video of 2 Guys, a Cricut, and a Folding Chair. Men have their own forms of creativity. When a project needs some mechanical ability, I always go to my hubby for help. He seems to be able to see patterns, take things apart mentally, and recreate them. I remember taking the ASVAB test in high school and being completely overwhelmed by the section where you have to match a 3-D image of a form to an unfolded/deconstructed version of the same form. Honor roll student, but couldn't figure out what some box looked like when unfolded and laid flat. Etsy is comprised of a very diverse group of sellers from all corners of the world, a variety of backgrounds, cultures, religions, income levels, and experiences. Still, men are extremely underrepresented on Etsy. The Men of Etsy Team reports that as few as 4% of Etsy sellers are men. Surprising! Some of the more interesting creations you can find on Etsy are made by men. Are they just teamed up with a wife, girlfriend, or other lady to have an Etsy shop (as is the case for my hubby) or are guys scared of the Etsy environment? You will see this trend in the blogging world as well. I was happy to find this blog called "1 Crafty Guy" where the blogger, Brett Lund, not only shows off his crafting skills, but is unafraid to tackle craft projects most men might avoid (glitter eggs, shrink art jewelry, and Cricut projects). There are men who quilt, men who knit, and men who make sew. In fact, one of the most amazing tatters I've stumbled across is a dude! He goes by Tat Man and he is a talented artisan and pattern designer. Maybe its time to share the sewing machine, Cricut, needles, hooks, and shuttles with the men in our lives and see what they come up with. They shouldn't feel less manly for using knitting needles rather than needle nose pliers. Not only will you get a fresh new perspective on crafting, but you will have more to talk about as you develop some shared interests. Maybe your dude will help you overcome a stumbling block in your own projects or tackle a skill you just couldn't master. I've enjoyed being in the handmade business with my husband and all the time we spend bouncing ideas off each other.